A website can be updated in minutes – even getting a web developer to do this is cheaper than re-printing literature. By putting items like student handbooks, employee guides, and flyers online, you can save an enormous amount of money. Combine this with a web-friendly email- marketing program and you can save thousands of euros each year. Many people today look at the existence of a website as a ‘validation of legitimacy’, much as we often look for the acceptance of credit cards. People who are reluctant to call can, at their leisure, visit your site and see what you offer. This means if its 3am on a Sunday, they can get some information. A well designed website will have an easy means of them contacting you, perhaps a sign up form they can fill out to schedule a visit or request additional information. A website can also be used by existing clients to generate referrals. A website is a 24 hour a day salesperson. Being able to learn more about your business will often turn a browser into someone who makes that phone call, or stops in to visit. Having a website puts you ahead of the competition. There’s no delay in customers getting information on your products or services. Imagine if your competitor has information online, and the best you can do is send a brochure overnight. A day is a long time for that potential customer to form an opinion. Having a website is an excellent way to generate new business, keep and grow existing clientele, save money and improve your bottom line. The Internet will be the first place someone familiar with computers will look for information. Search engine optimisation (SEO) and search engine marketing is any type of activity which is intended to bring traffic from a search engine to another website. Format.ie optimises all their sites as standard practice ensuring they appeal to search engines and humans alike. We identify major keywords which best describe your business and products, group these into phrases and build them into well-written copy for your site. We may well suggest changes to your copy. This may also include the addition of press releases and articles. The website will need, possibly, to contain hundreds of keywords within the copy. The famous META TAGS for holding descriptions and keywords are no longer enough; the copy must be engaging to both humans and search engines. Getting this balance right is crucial. Localisation, word-stemming and mis-spelling within a user search are all considered. See here for more information on Format Web Design Sligo Search Engine Optimisation (SEO). What is the Alt Tag/Alternative Text? When you put an image up on your website, every image has to have written in the alt text (alternative text) in the code behind the scenes, a description of the image and ideally its function on the page. his is for the benefit of web users who might have the images deselected on their pc and for the visually impaired who may be using a screen reader. So by completing the Alt Tag, you are making the website accessible to everyone. Moreover, it is also a tool for search engine optimisation. By writing a description of the image, it enables you to use a keyword. However, I would generally recommend keeping it to one keyword as if you start jamming keywords into the alt text, Google will penalise you for spamming and as opposed to going higher on the search engine rankings, you will start falling. Do you need to have a separate alt tag /alternative text for a gallery? Absolutely, however laborious this may be, every image needs to have a short descriptive text (ideally no more than 15 words). However if you have a database of images with a descriptive text relating to each of these, the web designer will be able to write code enabling the image description to automatically complete the Alt Tag saving you a huge amount of time. What is the difference between an App, a Website and a Website App? An App cannot be searched for via Google – generally it has to be searched through app stores on a phone, An therefore the customer is forced to download this onto their phone – i.e. Facebook App, Gaming Apps, etc. The app store has the ability to remove or discontinue the software remotely which can cause loss of data. What is a Website App? A web app is like a web page that has been specifically designed for a mobile for a specific function i.e. 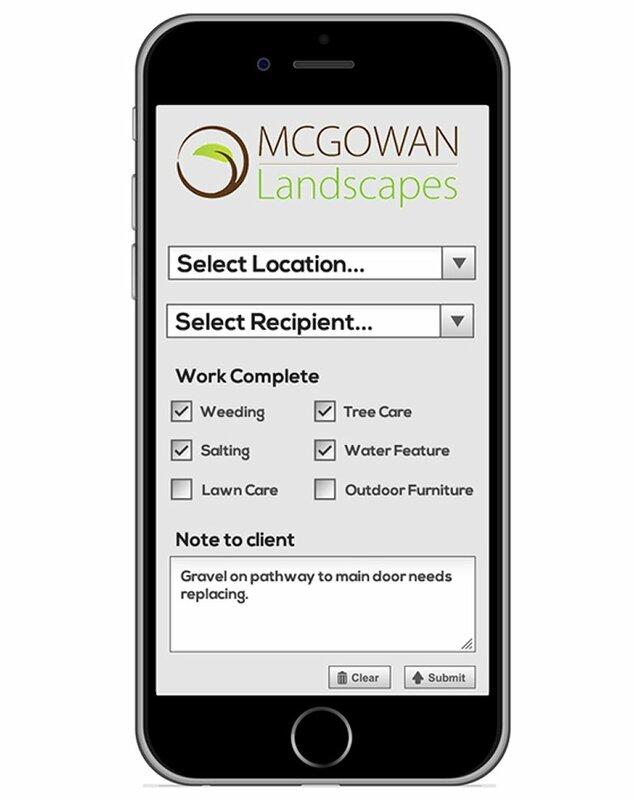 we created a web app for a McGowan Landscapes Sligo to complete gardening tasks done for his client (tick boxes) which when the ‘send’ button was hit was emailed to the client. Some web apps are used in intranets and schools. When Format.ie Web Design Services Sligo are asked to quote for a website, we will talk to you in great length as to your exact and specific requirements. Generally we will ask the following questions to get a grasp for your website needs in order to provide you with an accurate quotation. Do you require a domain name & hosting? Do you have a logo already or do you require Format to design a logo for you? Do you require an e-commerce website i.e. whereby customers can purchase from the site? If so, approximately how many products are you looking to sell from the site? Do you want to see via PayPal or other i.e. Realex payments? Will you be requiring video to be added to your website? Do you have video already made or are you looking for a video quotation for this too? Is this a simple website or will the pages contain links that go to other features within the site? Are you happy for us to show you how to update your website once built or would you prefer us to do that for you? Is your business on social media or do you need this set up? We can then link the social media pages to the website. Do you plan to send a regular newsletter to your customers as newsletter sign-up can be incorporated into your website? Do you plan to list your website on other business listings or do you require us to do that on your behalf? Do you require a Blog on the website?